“…you want me to tell you that story that happened that night at Falling Spring? You sure? Alright, it’ll be your sleepless night. Me and my cuz were giggin’ frogs down in that beaver pond one spring night when out of the blue we saw a fella wearin’ a strange hat walkin’ alone. We asked him what he was doing out here all alone and where he came from. He answered he came from a place with tall buildin’s and he was searching for answers that nobody had. He stood there, the palest, most pathetic creature you’d ever seen. 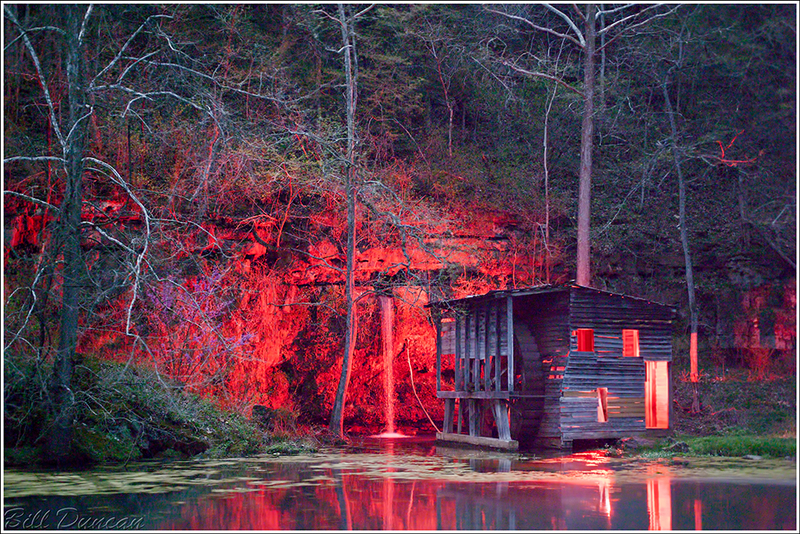 Paler than the moon standin’ above us, when all of a sudden eery red lights started comin’ from inside that old mill shack! Now, we had been standin’ outside there fer hours and hadn’t seen a soul inside or out. Before we could think, a sound that was louder and more fierce than a 10′ tall hoot-owl started and the trees began moving back and forth, even though there tweren’t a bit a breeze on the air to be had! My cuz and I had grabbed our poles and slowly backed ourselves out to the road and the safety of the truck. We looked over to where the stranger had been and noticed he was walkin’ towards the old shack! We shouted something to the effect of what the Sam Hill are you doing? He replied that he was going to see if the agnostics were right. I couldn’t get at what he was sayin’, and we couldn’t get him to stop movin’ towards that obvious poltergeist. The last question I asked was what his name was. He said something like Beelzebub, Bufford, Ozark Bill, or somethin’ like that. The last time I saw him he was walkin’ inside and stripping down to the suit he was born in. The lights got brighter and hotter. So hot and bright I had to turn away. We heard a screech worse than a Tom cat trying to mate with a pot belly stove and all of a sudden everything went back to normal. Stay away from the red mushrooms with the white spots!!!! !